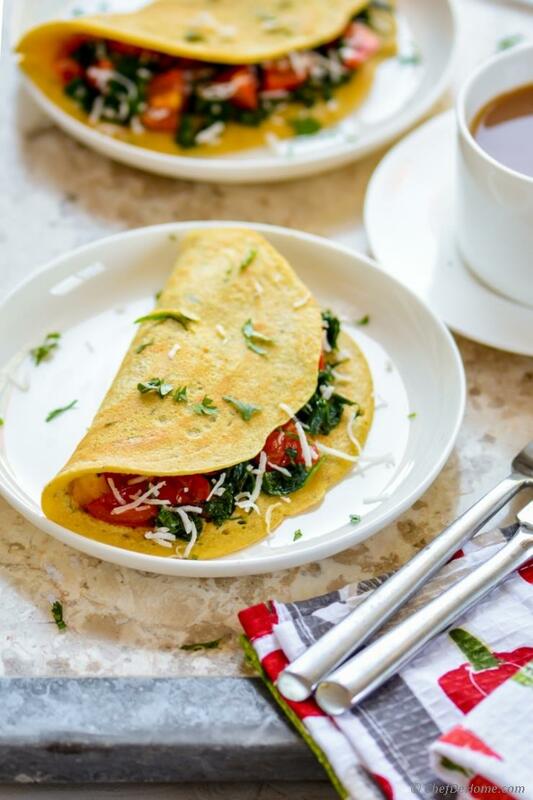 Eggless, vegan and whole grain chickpea flour breakfast "omelettes" made with Almond Breeze Almondmilk Coconutmilk and stuffed with seasoned spinach and cherry tomatoes! I remember sharing with you, that many days in a week, we are on eggless and meatless diet. 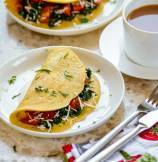 On such days, chickpea flour pancakes or "omelet" is one staple recipe in my breakfast menu! Since they are ready from scratch in just 20 minutes, I don't even feel lazy to make'em for the breakfast! 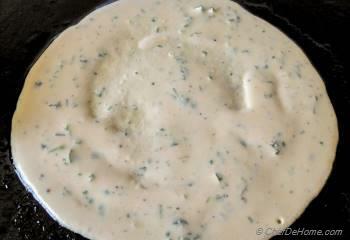 To make soft omelet-like chickpea pancakes, it is very important to add milk or yogurt in batter. To keep these vegan and lactose-free, I made these "omelet" with Unsweetened Almond Breeze Almondmilk Coconutmilk Blend. Addition of almond-coconut milk made them taste even more light and soft, with a subtle coconut flavor. 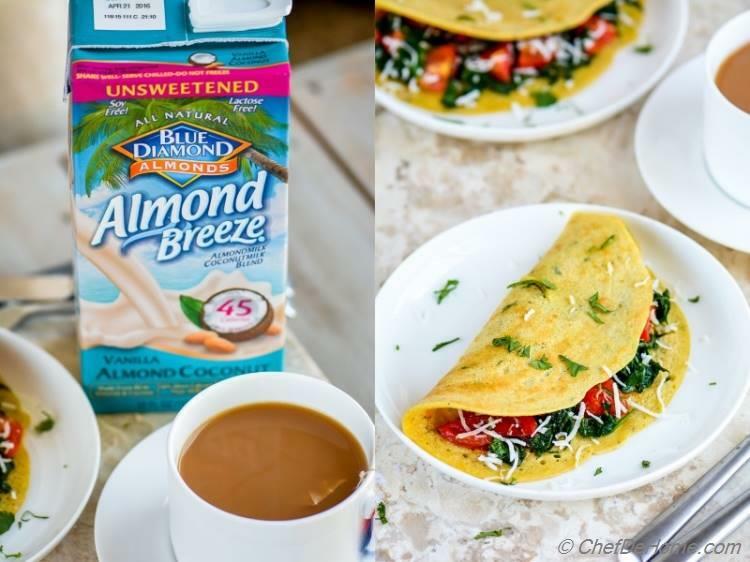 Almond Breeze Almondmilk Coconutmilk is made with real almonds and coconut. No cholesterol, soy, lactose, gluten and MSG free. It is vegan, lactose free, and is perfect to use in any of your favorite vegan recipes. You can even add it to your every-day coffee like I have also made my India Chai Tea with splash of Almondmilk Coconutmilk. By now, you already know that I love savory and whole-grain breakfast! Nutty Chickpea flour is not only a healthy, and gluten free flour.... but also source of filling slow-carbs which keeps you full longer! Chickpea Flour (Besan) is very popular in Indian cusine. 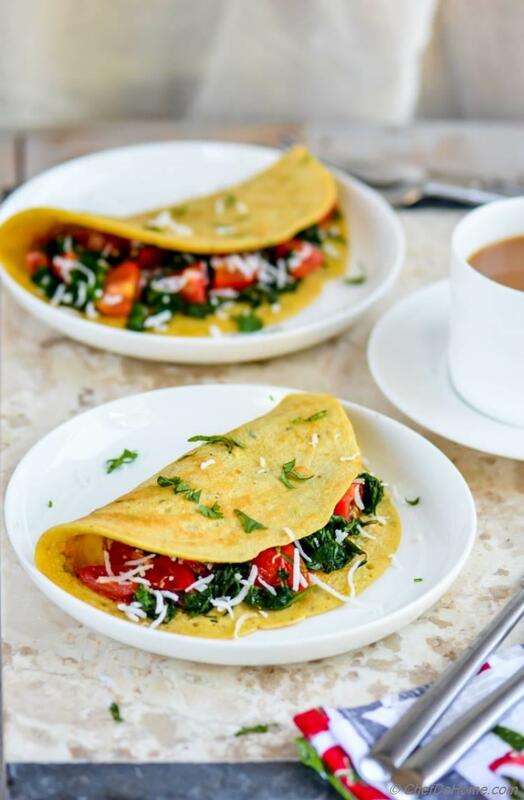 In fact, this chickpea flour pancakes (omlettes) are very common breakfast by name of "Besan Cheela or Chila" (chickpea flour seasoned pancakes). Interestingly, in Indian cuisine, breakfast is seldom sweet. Probably, that's why I'm always up-to sharing savory breakfast breads and other recipes. Like today's "vegan omelette" have no sugar. There is no added sugar in Almond Breeze Almondmilk Coconutmilk and I have added no sugar in the recipe as well. I was in mood to make these pancakes filled with spinach and tomatoes.... However, these chickpea pancakes are perfect blank canvas. Just like egg omelet, you can serve them or fill them with any filling or any variation of your choice. 1. Spread tomato ketchup or homemade sugar-free chutney on pancakes and roll for your kiddos to pack for breakfast. 2. Change filling, like use shredded cheese (not vegan) and/or vegetables of your choice. My other favorites are scallions and red bell pepper. 3. To make these pancakes/omelet gluten free, don't add semolina at all or replace semolina with equal amount of buckwheat/soy flour. The recipe makes 3 omelets, about 6-7 inch in diameter. Recipe doubles easily. You can also make a big batch and serve them family style with choice of different toppings. If making a big batch, keep cooked omelet warm in oven while finishing the rest. 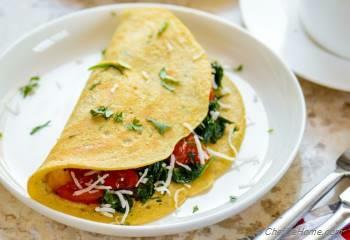 Smart Swap Replace semolina with quinoa or soy flour for Gluten Free "omelets"
1. 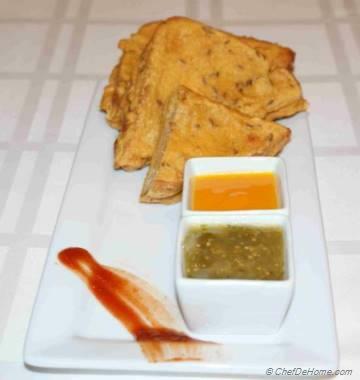 In a medium bowl, combine chickpea flour, semolina, baking powder, salt, oregano, cilantro, and black pepper. 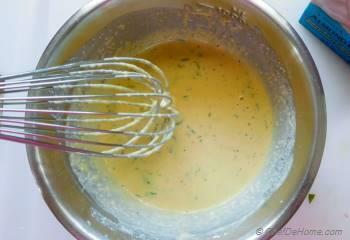 Add almond-coconut milk, then whisk until smooth batter forms. 2. Set aside to rest while you prep filling or for 10-12 minutes. Batter should be little thin than pancake batter. 3. 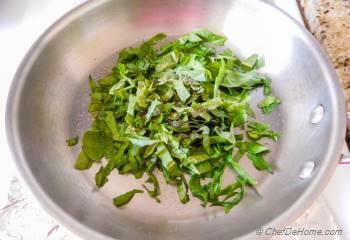 While batter is resting, heat 1/2 tablespoon oil in skillet, add spinach, cover, and reduce heat to low until spinach has wilted. Season with salt and black pepper. Fold in chopped cherry tomatoes and remove from heat. Set aside. 5. Flip the "omelet" with flat spatula and let it cook for 1 more minute. 6. 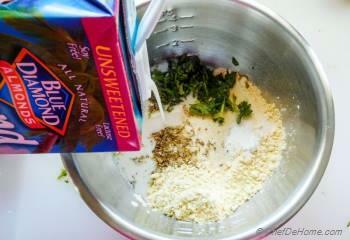 Now, add 1/4 of spinach mixture to half of the circle, fold the other half over, and transfer to a serving plate. Garnish with shredded coconut and cilantro. Repeat step 4-5 to cook remaining two chickpea omelets. You can also add some chopped nuts like almonds or pecans for additional crunch. Replace semolina with soy flour or almond flour for a Gluten Free "omelet"
If you don't like cilantro, you can also use parsley or basil. For more flavor, cook Chickpea "omelet" in coconut oil. Note: Non-stick pan works best for these pancakes/chickpea omelet. Thanks, Gauri! Your version sounds equally delicious! Thanks, Arpita! I know, it is basically like Indian cheela. And you are right, cheela usually has pizza-like toppings, and this one, I just stuffed like an omelette. Savita! This looks so good! 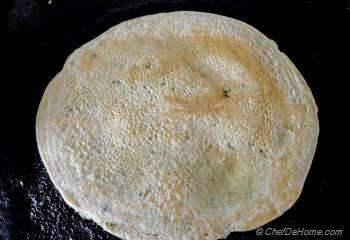 This reminds me a bit of 'thalipeeth' which is a Maharashtrian chickpea flour pancake. Your version looks great - especially with the stuffing! Thanks, Bach! 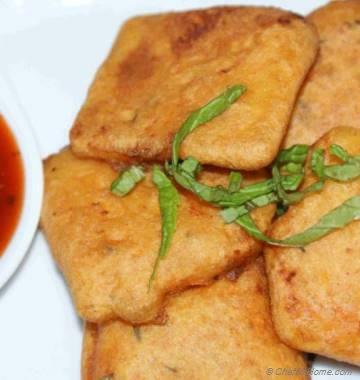 I think, there is version of chickpea pancake in each part of India. Like we often call it cheela in North, or pooda in punjabi. I heard ThaliPeeth name for the first time though. I guess this is kind of like a crepe in a way. I do love eggs, but it is nice to have a vegan option to an omelette. Thanks, Dannii! It sure is looks like a savory crepe too! These are most definitely super tasty! 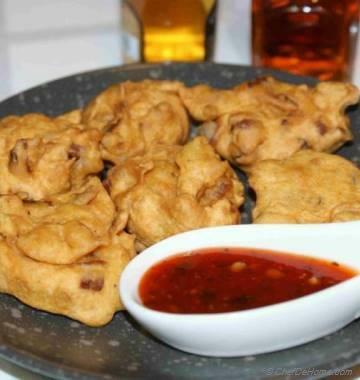 I have some besan flour at home and cannot wait to try this - they look so good! Thanks, Shashi! I hope you like it when you try! Your unique touches like the almond, coconut milk blend, semolina etc. takes this vegan omelette to flavoursome heights. The visuals are always awesome. You made the vegan omelette look so gourmet. Thanks, Piyali for your sweet words! I'm glad you like this vegan omelette! Almond-Coconut milk was stellar in this dish! yummy!! I love this besan ka cheela, it's one of my favorites for breakfast and love that you made it healthy with that filling!! looks amazing! Thanks, Manali! besan ka cheela is my fav too! This omelet looks incredible, Savita! Love the chickpea flour and the almond milk. What a delicious way to start the day! Thanks, Kelly! I agree, nothing better than wholesome and healthy breakfast! Savita, I have been planning to make chickpea flour omelet for week!! My daughter is allergic to eggs so I love to explore new breakfast options for her. This omelet looks amazing. Trying soon. Thanks, Oriana! You know, even I'm allergic to raw eggs. I'm sure your daughter will love this vegan "omelet" for breakfast! I hope you try it soon! I've always wanted to try chickpea flour, Savita! This omelet is absolutely gorgeous! I love the fresh ingredients in here! Thanks, Gayle for your sweet words! Trust me, these pancakes are simplest way to try chickpea flour.